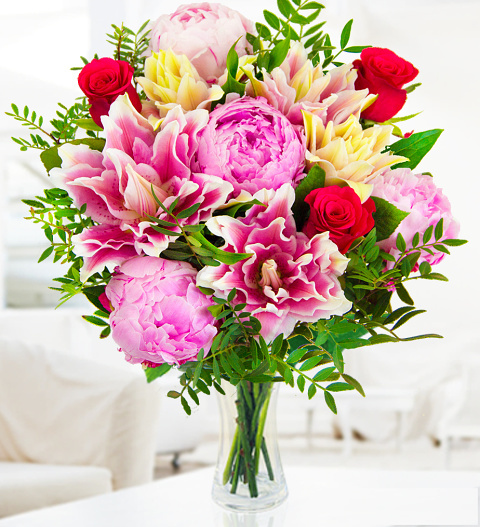 With perfect Peonies, double Lilies, Memory Roses and Pistagia, this fine bouquet is the very image of elegance. Send these flowers to a loved one for a special occasion or even just because! There's nothing like a fresh flower delivery to turn a frown upside down or show somebody that you care! It's also the perfect treat for those times you just feel the need to spoil yourself and brighten up your own home! Our team of professional florists work tirelessly to ensure that each and every stem is perfectly placed. Each of the lilies are Pollen and allergen free making them ideal for those with Pets! Chocolates may contain nuts.